September 2018, was marked a special month for the #Girlchild in Ariang School. 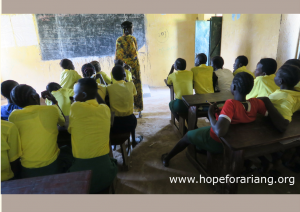 Two HOPE for Ariang team members, Elizabeth Deng and Josephine Lukas visited the school with the aim of highlighting and addressing some of the challenges eighth-grade girls face during menstruation. The visit shed light about HOPE for Ariang’s commitment to improving girls’ education and school attendance through the Women and Girls Empowerment Program. To create a lasting solution, the program also focused on empowering all the women in Ariang and surrounding Villages. In collaboration with Ariang’s female teacher Maria Adyior, the program started with interviewing the girls to find out how they cope up with menstruation in the absence of sanitary towels.12 out of the 23 eighth grade girls were interviewed. Only a few girls had knowledge about menstruation health management. Out of the 12 girls we interviewed, only one girl knew about sanitary pads and had underwears. All the others had very little knowledge about menstrual hygiene and management. All the girls opted to skip school during their periods. They preferred to stay at home for fear of stigma from their fellow schoolmates. Some girls said in most cases they can’t concentrate in class. They always think about sudden menstruation leakage and what others will say about them. We trained 23 eighth grade girls and 6 community women from the Ariang Village. 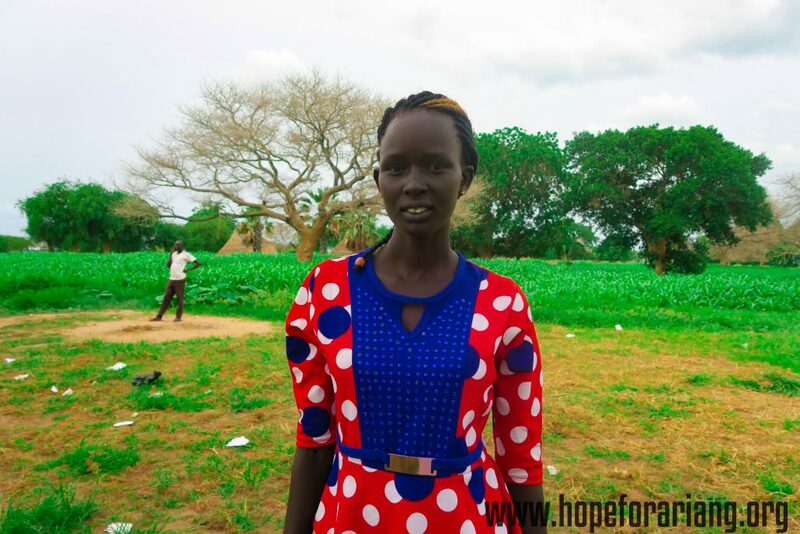 Teacher Maria Adyior led the training after receiving one-on-one training and coaching from the HOPE for Ariang team. She provided an overview of what is menstruation, menstruation management and challenges experienced during menstruation period. She also advised and guided them on how to stay clean and healthy while on their period. At the end of the training session, the women and girls were given a reusable sanitary kit which included three underwears, four reusable sanitary pads, a bucket and a soap. By using reusable pads, girls will be able to safely, comfortably and consistently manage their periods without worrying about embarrassment and shame. Comprehensive and intensive life-skills program. Menstruation support and kit distribution. Engagement of communities, families and schools to support girls. Our target is to empower all girls at Ariang school to happily attend school daily, concentrate in class and reach their potentials. If you would like to donate to our Women and Girls Empowerment Program, you can make a donation here. Simple, write “Ariang Girl” in the comment box. 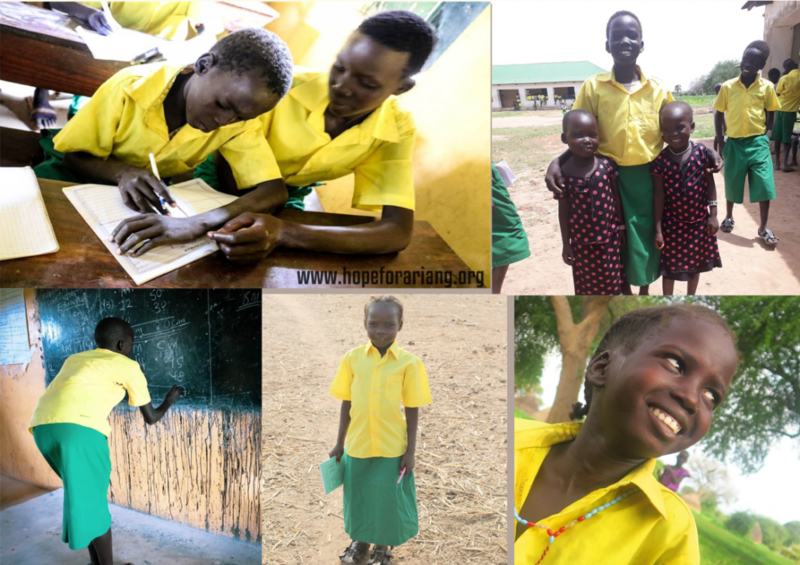 Help us to ensure that all girls can go to school, attend classes, and complete their education without any barriers so that they can reach their full potential and be the change in the community. We want to make our girls shine.